I headed there twice but was turned back by weather both times. You're looking very serious there, G00SE. Thanks for sporting the Trailspace gear on your climb. Yeah, ppine, weather turned us back 1000' from the summit, but I can scratch this off my Bucket List. Sorry I missed this post, very rad! I did this hike in 2013 -- It was really rewarding! My parents were HEAVY smokers, (I was exposed to up to 5 packs a day, second hand smoke, and we didn't realize how deathly allergic I am to tobacco smoke) I was constantly sick with bronchitis and pneumonia. To have accomplished this was beyond my wildest dreams. It was quite a view, and a great ride down, glissading! 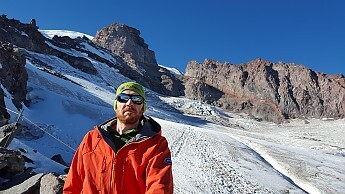 Today I tackled Camp Muir with Tom and Alex. I have LOTS of trouble with altitude because of scarring in my lungs. But I did it! I hit 10,000 feet. I NEVER dreamed I could do such a difficult hike--gaining 4,800 in 4.5miles! All forums: Older: Going down was the pits! I need suggestions, please. Newer: Where am I going to hike? !